After a catastrophic impact blows a cometary object apart, the pieces can recombine over the course of days or even hours. Comet 67P/Churyumov-Gerasimenko may have survived multiple impacts on the way to forming its peanut shape. New research suggests that comets that are destroyed by impact can still protect their easily evaporated material, with slow-moving pieces joining together to create two distinct lobes. The findings suggest that 67P and other bilobed comets could have taken a beating in their past. "Although the number of comets for which we know their shapes is still few, the tendency so far is for them to be bi-lobate [two-lobed]," Stephen Schwartz, a researcher at the University of Arizona, told Space.com by email. Schwartz and his colleagues ran powerful simulations of the formation of 67P. They found that a catastrophic collision at various speeds would allow some of the comet's material to slowly reform, creating two massive pieces that would then slowly merge together. The results re-created some of the comet's prominent geological features, such as pits and stratified surface layers. "The features of 67P that Rosetta observed … are consistent with 67P being a remnant of a catastrophic disruption event," Schwartz said. "It doesn't close all questions, but it's significant." Comet 67P's rubber-ducky shape could have formed after slow-moving particles bonded following a devastating collision. But there's a problem: timing. In the early solar system, objects traveled through space at a more relaxed pace, before growing planetary embryos stirred things up. Combined with observations of 67P's volatile material, which evaporate easily at higher temperatures, those slow early collisions seem to argue for the comet's birth early in the life of the solar system. However, Schwartz said that there are fairly strong dynamical arguments that 67P could not have survived the 4.5-billion-year life of the solar system in its current shape. That means a slow collision would have to have occurred later, when such collisions were virtually nonexistent. Now scientists have found a way that comets like 67P could form their peanut shape at any point in the solar system's history. Schwartz and his colleagues discovered that the pieces that survived a catastrophic collision could salvage their volatile material and slowly bond as a bi-lobed comet. The scientists ran simulations of objects made up of similar material traveling at a variety of speeds. In each case, the original generation of comets was blown apart. 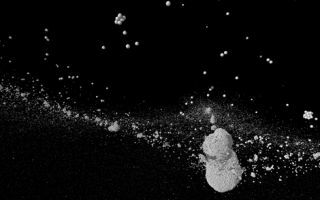 Although the collision created hundreds of thousands of particles, only a small fraction of them were heated. And those tended to be hurled away from the rest of the debris, a feat made easy by the small mass and small gravitational pull from the original comet. "With escape speeds no greater than a few meters per second or so, it doesn't take much for this stuff to be dispersed," Schwartz said. The material left behind retained the same makeup of the original destroyed comet. In the hours or days following the collision, that primordial material then re-accumulated not into a single comet but into several smaller bodies. Eventually, two or more of the larger bodies pressed together to form a peanut-shape resembling 67P. "This suggests that the volatile compounds found inside the cometary nuclei can subsist through multiple collisions, including highly energetic catastrophic events, throughout the age of the solar system," the researchers wrote in a paper on the new work, published in March in the journal Nature Astronomy. The team also found that several of 67P's puzzling features could be explained by catastrophic collisions. Large-scale fracturing observed in the comet's Hathor region could have resulted from cracking during the impact. Layering on the comet could have occurred in the days and weeks after the disruption, when small pieces blown off the original object were flattened as they fell back to the newborn comet. The gradual re-accumulation of these small pieces would create a layered appearance. Larger blocks crashing back down onto the comet could explain the large pits across the surface. "One great strength of this scenario is that since catastrophic disruptions have been occurring continuously since very early on in the history of the solar system, it can explain the merging of the two components of 67P without any constraint on the epoch of its formation," Schwartz said.